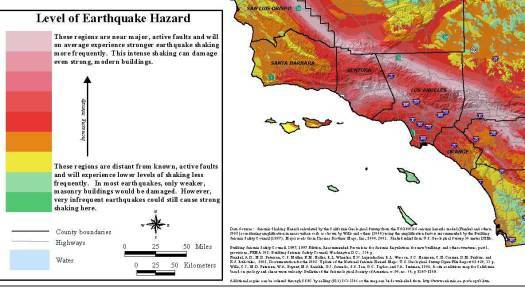 (April 23, 2003) -- The CA Seismic Safety Commission has released a map showing what it considers earthquake shaking and damage potential for CA. The So. Cal area excerpted by us (below) shows the LA-LB area with mid-high intensity ground shaking and damage from anticipated future earthquakes. The map indicates predicted shaking and damage with nine colors...and LB is in color code 5 of 9 (dark red). That's better than lighter pink (the worst in inland areas near the San Andreas fault and parts of the SF Bay Area) but not as good as brown/yellow areas in the southern half of Orange County and southward. The statewide map is available in larger, more detailed form...and LBReport.com posts the links to it from the CA Seismic Safety Comm'n web site in both .jpg and .pdf formats on links below. Caveat: They're large files and may take a few minutes to download via modem. Tip: The pdf file is a large file but lets you to magnify small areas. The CA Seismic Safety Commission says the map "shows the relative intensity of ground shaking and damage in CA from anticipated future earthquakes. Although the greatest hazard is in the areas of highest intensity as shown on the map, no region within the state is immune from potential for earthquake damage."